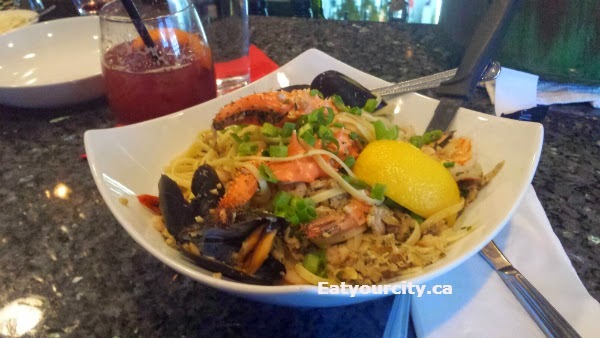 Eat Your City: Cafe Amore Bistro Edmonton, AB - tasty down to earth Italian fare with big seafood pasta bowls! 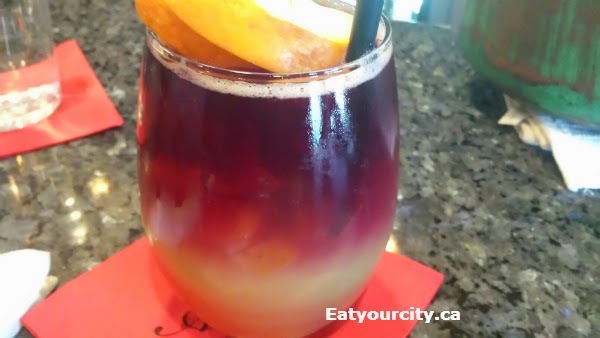 Cafe Amore Bistro Edmonton, AB - tasty down to earth Italian fare with big seafood pasta bowls! 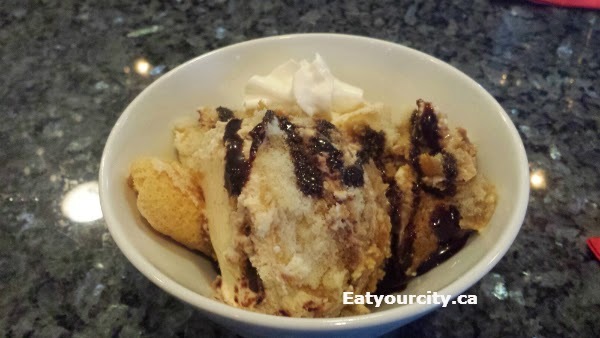 Posted by When you step inside Cafe Amore, its like taking a step back into time where good honest food made by family only run restaurants trumped places that were more glitz, glitter and lacking in quality and substance. Where kitschy memorabilia and mismatched decor are completely ignored as you inhale the heady scents of garlic, wine and savories drifting from the kitchen. Where you honestly have to spend several minutes just reading the huge menu and spending even more time trying to decide from all the choices what you want to nosh on. And when the food comes out, you eat until your belly button is going to pop like a button, and still have plenty of leftovers for lunch to enjoy the next day. 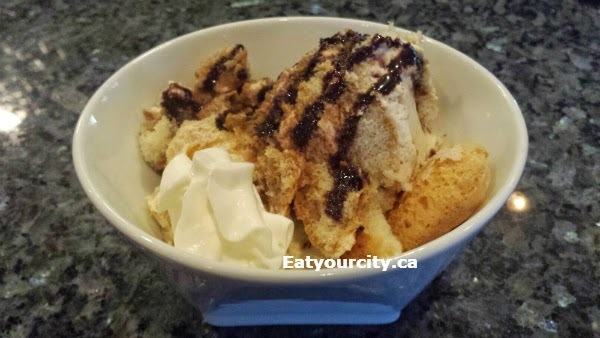 This and more, is why Cafe Amore still remains a favorite and an "oldie" for foodies and families alike in Edmonton. We dropped by after work and didn't have reservations, so we sat at the bar. Being at the bar, we got to see the barista mix together all sorts of colorful cocktails. Its probably the only bar that has sterilized squeaky clean glasses, as the barista also uses the steamer from the fancy espresso machine to steam clean the glasses lol! 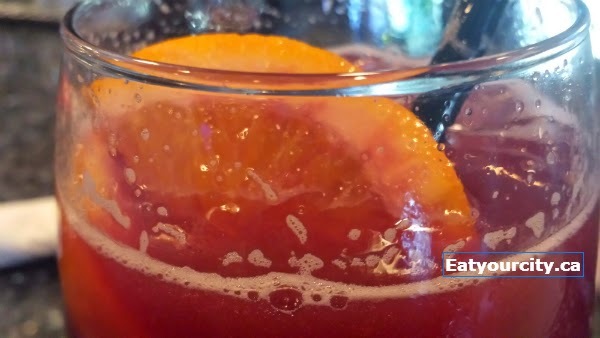 We started off with a sangria that had a nice hit of sweetness from the liquors. 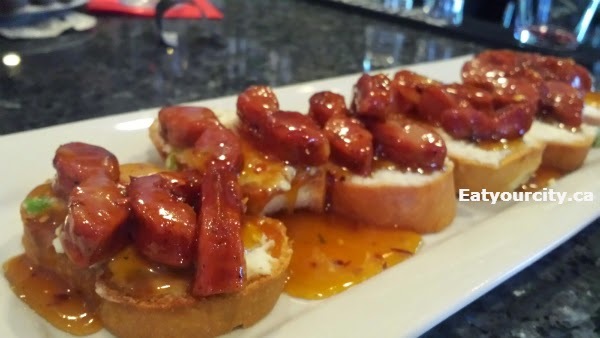 Since it was just the two of us, we were eyeing up the brucshetta as our appy, but were quickly convinced by our barista to try their Maple Sausage Crostini - homemade sausage on toasted crostini with a sweet chili maple glaze. 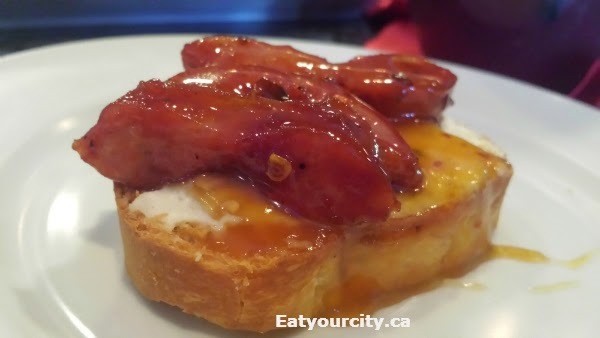 Crostinis had a creamy cheese spread on it, a good chunk of savory sweet sausage and liberally drowned in a sweet chili maple glaze.. it was like eating a ridiculously messy sausage breakfast sandwich. Fork and knifed needed as the crostini was pretty thick so it wouldn't get soggy from all the toppings. Perfect for sharing, and with just the two of us that night, I was pretty full after eating half the appy lol! Nom! Fiancé had his fav - Chicken Parmigiana. 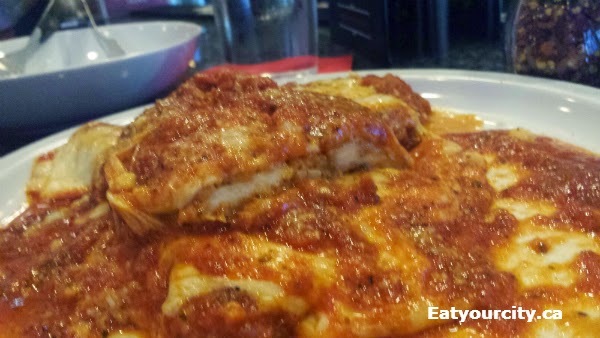 The chicken was lightly breaded and almost completely hidden in a mountain of homemade tomato sauce and melted cheese. There's two pieces of tender chicken in an order - we just had to find them under all the yummy saucy cheesey goodness - cut one in half so you can see the chicken inside. I went with their infamous Amore Pescatore with garlic white wine sauce (tomato sauce available too - heck, you can customize any of their pastas any way you want). Its a smaller portion of the King Pescatore where they toss in a lobster to round things out and supposed to serve two. 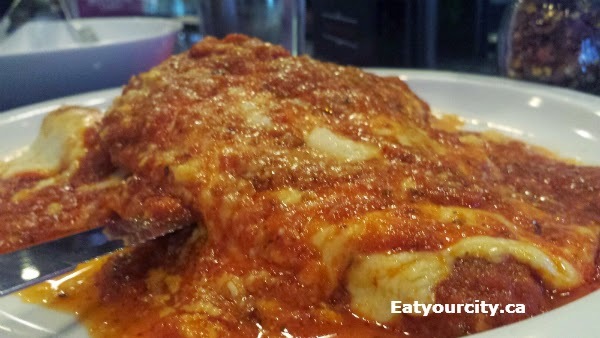 The Amore Pescatore easily fed two, or one super hungry person with lots of tummy room. The bowl its served in looks deceivingly small, but there's a lot of shrimp, mussels, snow crab, scallops, baby shrimp and clams buried in the al dente linguine sitting in a pool of delicious garlic white wine broth. 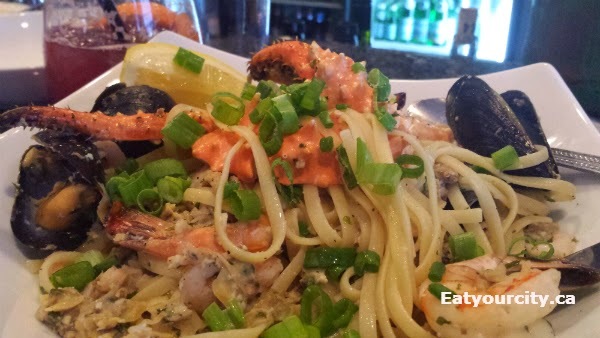 You can't see the generous amount of seafood in the dish all at once as its tossed throughout the pasta. 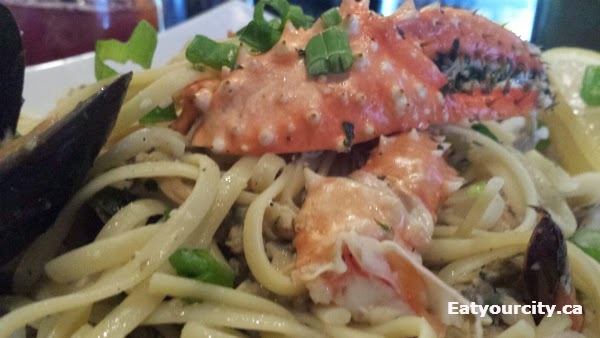 If the chef chose to put all the seafood on top of the pasta, it would probably take up half the bowl lol! I totally had the best leftover lunch the next day! We were about to explode from all the huge portions of food, but we made room for their homemade tiramisu. Luckily for us its a very very light version of tiramisu as we had very little tummy space left. If you prefer your tiramisu with lots of espresso soaked ladyfingers and just a trace of whipped sweetened marscapone, then this tiramisu is made for you! Hours Mon-Thurs 11am-10pm, Fri 11am-11pm, Sat 5pm-11pm, Closed Sundays.